What has happened to the renowned slot developer IGT over the past year? I remember when this developer was famous for releasing gritty slots such as the creepy Black Widow slot and the hauntingly freaky Day of the Dead slot. Now all we get are happy clappy slots that feel like they’ve delved into the brain of your own mother! IGT... What Is Going On? In Bloom is the latest slot release from IGT that makes me feel that the head of their creative team is a woman or a very effeminate man. Ok, I could tolerate the Oriental-themed Red Mansions that had clearly taken inspiration from Memoirs of a Geisha. I could also just about put up with the grannies favorite Western Belles. Is this slot too far I ask myself? Or is there a chance my seemingly endless faith in IGT slots can be saved? This slot is a 5 reel, 40 payline release that appears to have been designed by listeners of Classic FM. I really cannot imagine a slots player in their 20s or 30s, male or female, thinking “wow, this slot is drawing me in with its cool graphics”. The symbols are a range of flowers such as lilies, roses and poppies that are presented in a stain glass window effect along with regular 10 through to Ace symbols. It is interesting to note mind that the maximum pay out is £250,000. The one stand-out appeal of this slot is the inclusion of the Symbol Burst feature that means players can hit up to 15 of a kind on this slot on every spin. That means that players can be in for some big wins with even the regular symbols. If you manage to see two or more butterflies appear across the reels then this will trigger the Garden Bonus where you can earn some free spins. 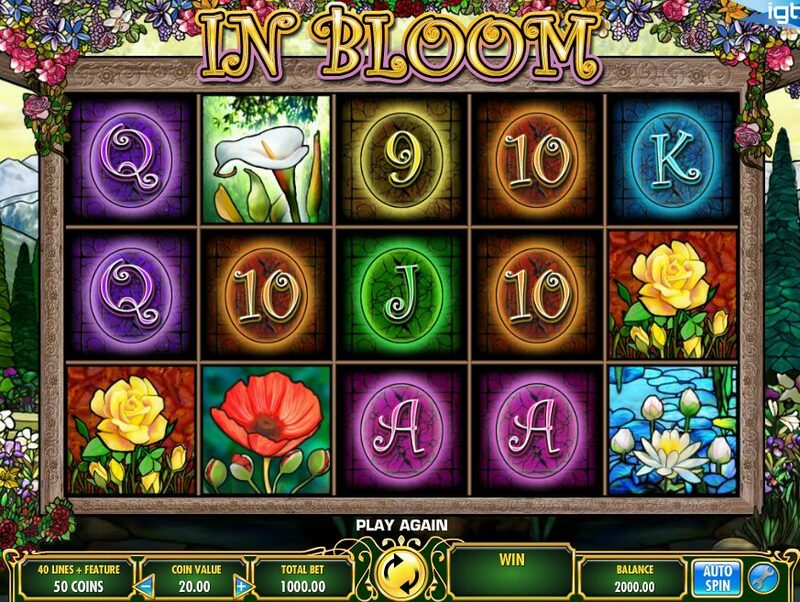 The number of free spins you will earn depends on which flower garden you pick when the time comes. There is also the Bonus Bump feature which is essentially a Pick’ em Bonus where players can earn up to a 50x multiplier. As if the Symbol Burst feature didn’t boost the wins enough! 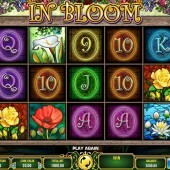 In Bloom is not a slot that I would initially play but it was fun to play when I got into it. It was a bit strange playing a slot and keeping an eye on the regular symbols with the Symbol Burst feature rather than looking to trigger the free spins. I got some big wins with the roses and lilies but did not even get close to triggering the free spins which might say something about how easy the free spins are to access. This slot did remind me slightly of IGT’s previous slot release Garden Party but is arguably more action-packed than that slot. Maybe I was a bit too judgmental at the beginning of this review. I’m not the biggest fan of flowers and stain glass windows… unless they pay out 2,000 coin wins on a regular basis!